We heard you… and are excited to announce that we are creating a new Open House Flyer experience in Unify. The changes will occur over the next several months, but there will be some changes to the process that you will immediately see that will have an impact on the inventory of properties available to you. Then watch for more changes in the weeks to come. The biggest change is that we are going directly to the MLS and accessing property data and images through the partnership with your Real Estate agents. Two new fields have been added to the Marketing Partner Profile that will help facilitate this. The first is the “MLS Board,” which is a drop down list of available MLS boards that your Partner may be a member of. Simply select the appropriate board for each of your Marketing Partners. The next is the MLS Membership Number of the Marketing Partner. 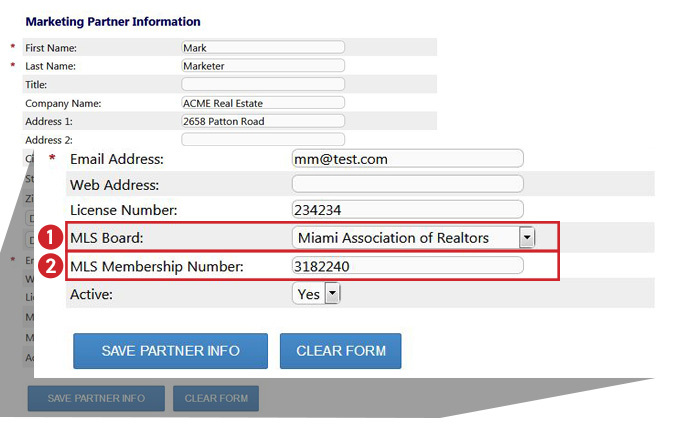 This is the entry that allows you to access any of the property information for this Partner available at the MLS. Simply fill in that number here and you are ready to begin. More availability of properties across the country. More Photos will be available on the Open House Flyer tool. The ability to select and move photos.